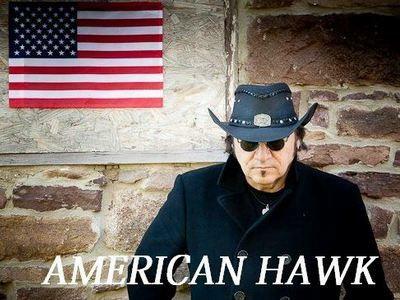 Join us this week as we welcome the country rock band, American Hawk. Hailing from Newtown, PA., American Hawk is US Navy veteran and singer/songwriter Bobby Rotondo(AKA Bobby Ro) performing with some of New Jersey & Pennsylvania's finest musicians, all are veterans of the East coast music scene. They play a mixture of country/rock & patriotic original tunes. The band has opened shows for Chuck Berry, Kenny Rogers, The Kingsmen, Jack Bruce, Peter Tork's Shoe Suede Blues, The Charlie Daniels Band, and country music vets The Bellamy Brothers. We will talk with them about their upcoming schedule, get a behind the scenes look at their music, feature their latest songs and ask them to share their message for the troops. Please be sure to visit American Hawk at http://americanhawk911.com/ and spread the word. Fans are welcome to call in and chat live with American Hawk during the show. If you would like to participate in the live chat during the show, you must sign up on the show site first and then log in during the show. More great music for a really great cause! And as always we will give shout outs to our deployed military listeners. Be sure to join us, Sunday November 4th 2012 at 4:00 PM EST! Our message to the troops....WE do what we do, because YOU do what you do.